The Hasselblad Lunar is the most expensive compact system camera in the universe but is it worth 6000 of your Earth Pounds? The Hasselblad Lunar is the brand's first camera for consumers, and also its first compact system camera (CSC). The famous Swedish camera expert has a strong heritage among photpgraphy pros and is famous for supplying Nasa with imaging equipment for various space programmes. It was Hasselblad that produced the cameras for the Apollo 11 moon landing - and some of those cameras stil remain on the lunar surface today. Unveiled at the Photokina 2012 show, the Hasselblad Lunar has been the subject of much debate among photographers and camera nerds, thanks to its devisive design and out-of-this-world price tag - a cool £6,000. The rather steep asking price is particularly jarring when you consider the fact that this is basically a Sony NEX-7 compact system camera with some Hasselblad-flavoured design flourishes. Firstly, it's worth mentioning that the camera comes in a fancy box. A very fancy box. Just check our Hasselblad Lunar unboxing video if you don't believe us. Once you've got past the puzzle box-like wrapping, you'll see that the camera itself is pretty chunky. Measuring in at 142 mm × 82 mm × 70 mm, it's a fair bit bigger than the Sony NEX-7 that it's based on, although the meaty chassis and large grip give it more of a pro SLR-style look, like the Nikon V2 CSC. At 570g, this certainly isn't a lightweight CSC like the Fujifilm X-M1, and you'll definitely know you're carrying it. The advantage here is that, while some smaller CSCs can feel a little unstable as soon as you attach a lens to the front, the Lunar's heavyweight body feels a bit more balanced and SLR-like. The design won't be for everyone, though it is very distinctive. It's not quite as streamlined as the likes of the Leica X2 or Fujifilm X20, but we liked the retro aesthetics. However, we're still somewhat flabbergasted at the decision to include pinky red jewels on one of the back buttons and the power switch. Although they're small and not instantly noticeable, this kind of bling looks more like something you'd find on Liberace's jacket than on a Hasselblad snapper. The camera comes in five colour options - black or brown leather, carbon fibre, olive wood or mahoganny (we had the brown leather model in for review). 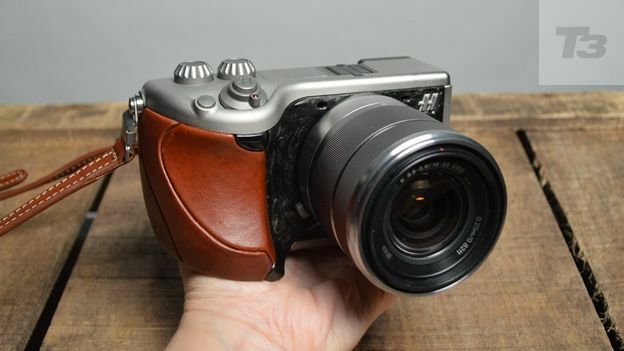 Our camera came with a splendid leather shoulder strap to match the leather grip, sporting embossed Hasselblad logos along with a grippy Hasselblad-patterned underside to the shoulder padding. The Lunar packs an impressive 23.5mm x 15.6mm APS-C format CMOS 24MP sensor and uses the same E-Mount lenses as Sony's NEX range of cameras. It's supplied with a standard 18-55 zoom lens. As you'd expect, the Lunar's controls are very much like those of the Sony NEX-7. Aside from the power switch and the shutter button, the top of the camera body is home to a navigation button for tinkering with the settings for triple-dial-control operation. This means that you can change various settings simultaneoulsy on a single screen. You'll also find two unmarked dials, a pop-up flash and a hotshoe adaptor. The left and right control dials set the items that appear at the top right or top left of the screen. On the backplate there's a control wheel surrounding a central button plus two soft buttons (above and below the dial) to which you can assign functions. There's also a dedicated video record button just above the thumb grip, which we found ourselves hitting by accident on several occasions. There's also playback and pop-up flash buttons over the top of the screen. Mini USB and mini HDMI ports are hidden away on the left-hand edge. Like the NEX-7, this is a semi-pro camera, and definitely not a point and shoot. Thanks to the unmarked controls with multiple customisable options, you need to spend some serious time getting to know the functions, but once you have, you'll find that the flexibility on offer is very impressive. The camera features a pivoting 3-inch LCD screen with 920k-dot resolution. There's no touch screen operation as on the Sony NEX-6, but the display will tilt 90 degrees upwards and 45 degrees downwards. This is especially handy when shooting at awkward angles or in bright sunshine to avoid glare. However, the extra Hasselblad bulk on the chassis means that the tiltable screen isn't quite as easy to grapple as on the Sony NEX-7. Along with the screen, you have the option of using the Electronic Viewfinder (EVF). Packing a 3,359k-dot resolution, the EVF fires up rapidly when held up to the eye. It works well, although does struggle a little in low light. The camera is supplied with a rechargeable 1020mAh Lithium-ion battery, which is said to offer 430 shots when in LCD mode and 350 in viewfinder mode so if you're using a combination of both (as we did) you'll end up with something in between. It's not a bad battery performance for a CSC, but nothing out of the ordinary either. Picture quality is one of the NEX-7's strong points and the same can be said for the Lunar with images packed with detail and the supplied kit lens giving excellent results. You can shoot in JPEG or RAW or a combination of the two. The Lunar packs an impressive ISO range of 100-16,000, and as you'd expect, images do appear rather grainy as you push up into the further reaches of the settings but the camera copes admirably well with low lighting conditions. There are plenty of telltale Sony features here including the effective Sweep Panorama mode along with Smile Shutter and the Partial Colour effect, all of which work well to produce some good results. The picture quality is about as good as you can currently get from a CSC. The Lunar also performs well on video, recording high-def AVCHD video at a resolution of 1920x1080. The Sony NEX-7 itself is one of the best CSCs around, but at £1,129 it's also one of the most expensive, making the Hasselblad Lunar's £6k asking price absolutely astronomical. The Lunar offers a big sensor, good quality high-res images and video as well as a strong design, but at this price, it's hard to recommend, especially as the NEX-7 was only denied a five-star rating because of it's steep price. Having said that, if you're even vaguely considering buying a camera like the Lunar then it's clear that value for money isn't high on your agenda. If you're an amateur snapper you probably can't afford it. If you're a pro you're likely to be spending your money more wisely. If you're a Hasselblad purist, you're probably outraged at your beloved brand putting its badge on another maker's goods. If you happen to have six grand to spare and you want a fancy looking compact system camera with the Hasselblad name on, you'll be over the moon.